In late 2013, our leadership (lead pastor, board, senior staff) began praying in earnest for a plan to address our current and future growth needs. We were bursting at the seems and in need of a long-term plan specifically to respond to critical needs in the Little Blessings Wing and the Admin wing. We also felt the need to expand our parking, develop the natural areas of our campus and pay off our debt. We asked our Resource Management Team to study the need and to report back to us how much it would cost. 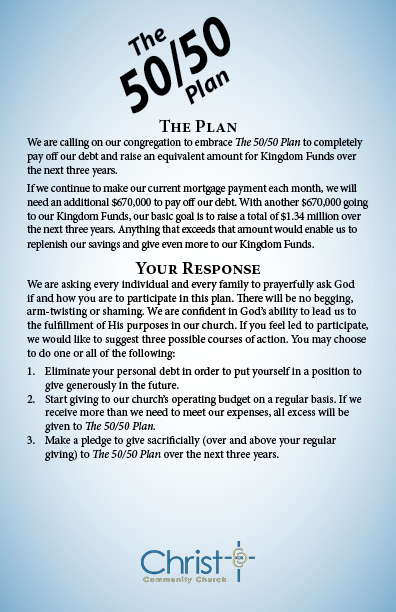 Their answer (assuming we would tithe all gifts to our Kingdom fund) was approximately $4 million. After much prayer to discern God’s will and direction for our church, we concluded that God wants us focused on a different growth plan. We believe our Phenix City campus is the model for future expansion. Rather than making extensive investments in brick and mortar at CCC-Columbus, we are to continue reproducing by giving birth to campuses throughout the region. See the following handout for a detailed explanation of the plan (click on each graphic for an enlarged view). For a look at all full-time missionaries supported by CCC on a monthly basis, click here. Want to participate? 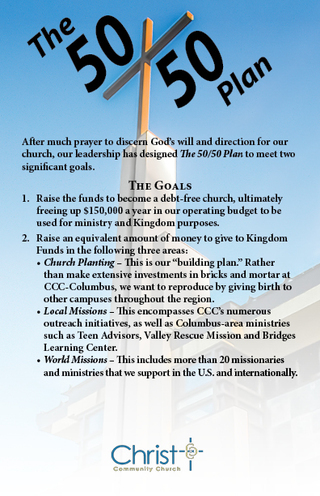 Download the 50/50 Plan Pledge Card and drop it in an offering box at the back of the sanctuary, or mail to the address below.